GRAVENHURST — Lookout London, the Gryphons are back. 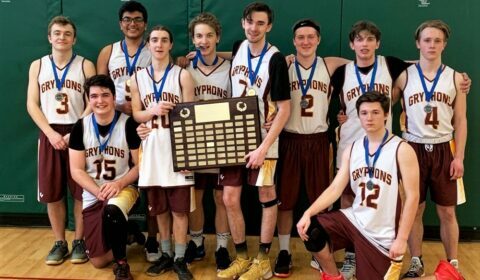 The Gravenhurst High School Gryphons are headed to London on Sunday for the OFSSA senior boys’ D-1 championships for the second straight year. The begin play Monday. The defending GBSSA boys senior basketball champions is headed to southwestern Ontario Sunday for the OFSSA provincial championships, after beating Barrie’s Unity Christian School 48-37 last Friday. And the best team in Georgian Bay two years running, with a 12-3 record, is ready for the challenge says their coaches. Thursday night they had “the best practice we’ve had all year,” said assistant coach Jennifer Schandlen. And the Grade 11 and 12 students are feeling good and are “focused” and “pumped” about their chances of making it to Wednesday’s finals, said head coach Gillian Humphries, who is on mat leave, but still coaching the Division A team (schools with under 500 students). The 14th-seeded in the province opens round-robin play Monday against 8th ranked Villanova College (TDCAA champs) in the second game of the 20-team tournament, after arriving Sunday for an all-teams banquet. Humphries says the team needs to “get off to a quick start,” to set the tone to advance, after they lost three close games at last year’s OFSSAs when they were ranked 19th. GBSSA champion Gryphons: Left, Charlie Cleary, Oliver Fellows-Zanello (kneeling), Shrey Patel, Prestyn Colliton, Nolan Pratt, Logan Fick, Jackson Reimer, Cole Ruddell, Austin Hamer (kneeling) and Nick Lami. Absent: Hayden Ramer. With seven returning players — including Logan Fick who was a starter last year — she said the Gryphons will be relying on their strong outside 3-point shooting. After finishing the regular season 8-1 and narrowly losing (54-50) their Muskoka-Parry Sound league championship to Huntsville (Division AA), the Gryphs are a much more experienced and comfortable team heading into their second provincial championship, said Humphries. They will be joined by a couple of family members who will be cheering them on, including Humphries’ 5-month-old son, Ben, and his grandparents Hal and Judy Humphries. Fellow students at GHS gave the team a sendoff Friday with a big banner and announcements in the morning. Last year, said Coach Humphries, the games were streamed live. Gryphons layers Asutin Hamer and Logan Fick got a great sendoff Friday as they got ready to go to London Sunday.